Today we had a fairly decent almost spring day. 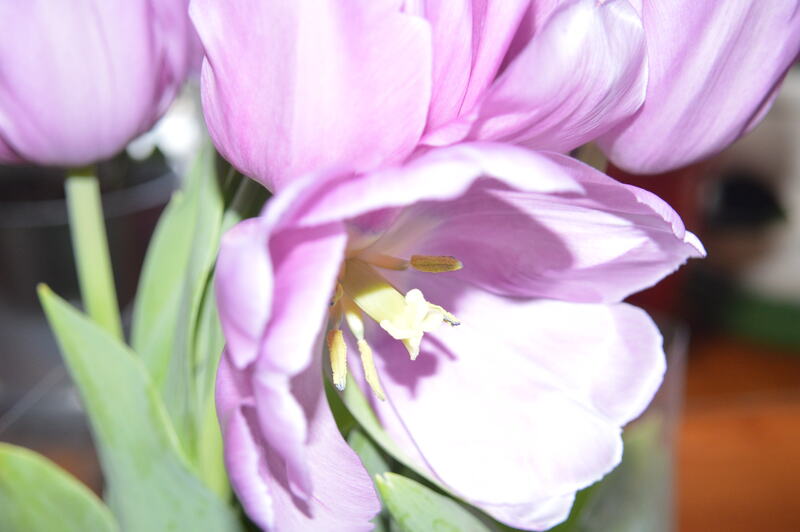 I had purchased some tulips and I was afraid I would not be able to plant them because the temperature was too low. I put them on my bay window and watched the beautiful lavender tulips start to lose their luster and begin to shrivel. I took a picture of them everyday as they were still closed buds when I first got them. To my surprise one of the tulips had a twin. In other words, two flowers shared one stem. It was amazing how the flowers accommodated each other. Curiously the twin tulips were the last to dry up. But one dried up more than the other. At first I was going to throw out the plant altogether. I was so frustrated with the changes in temperature and the early spring snow and wind storms. But I decided to plant the bulbs instead and hopefully they will bloom again next spring. I raked and cleaned the area where I wanted to plant some daffodils. We had a few trees fall during the last snow storm. We had many branches strewn all over our lawn. So we were finally able to bag all the leaves, pine cones, twigs and pieces of bark. I visualized the area with new shrubs and big terra-cotta pots with beautifully arranged flowers. I drew sketches of how I wanted our garden to look. The next few days are suppose to be more spring like. The garden is now ready to welcome butterflies, and song birds. I looked up at the sky and I saw a few birds perched. There was a small nest near by. Spring is here after all. Mindful gardening is about connecting to nature. Gardening is proven to help people relax and. bring about mental well-being. It is important to stay focused and to have a plan. Appreciate the process and visualize what you want to see in your garden. Map out your garden. Decide if you want to add some additional accessories. If you decide to have a vegetable garden as well, keep it simple and plant the kinds of vegetables that grow quickly. Don’t be afraid to get your hands dirty. Keep a garden journal. Write in it the feelings that emerged, what you observed. Take deep breaths. Happy Gardening! This is lovely. Being in the garden is extremely therapeutic. That’s the point. Thanks for stopping by.